The 6-foot wide Snap and Grow Greenhouses are sturdy, easy to assemble, and come in three different lengths. Snap & Grow 6’ series greenhouse comes in three lengths: 8’, 12’, or 16’. The frame is heavy-duty aluminum, and it clicks together with the rigid polypropylene connectors. Nothing will rust on this greenhouse. SnapGlas polycarbonate panels are virtually unbreakable, and 100% UV protected. Panels easily slide into the frame and lock in place without any complicated hardware or tools. Designed with a gutter system, so you can use the roof to collect rainwater. There is an adapter on one of the connectors that attaches to a hose and connects to a rain barrel. This potting bench is constructed of heavy galvanized steel. It features a raised shelf so your tools are always within reach, and a spacious work surface for potting several plants at once. Rubber feet take the worry out of scuffing your deck or patio floor. The Bi-Level Shelving System from Poly-Tex is made of strong galvanized steel. Set it up inside your greenhouse for the perfect shelving solution. Small plants and tools can go on the bottom shelf, and taller plants on the top. This shelf system maximizes space and growing capacity in your greenhouse. Provides the perfect place for seedlings or small potted plants. Lightweight shelf attaches directly to the inside wall and can be repositioned easily. Mounting brackets are made of galvanized steel and shelf top is outdoor resin. The automatic vent opener provides care-free greenhouse ventilation. Designed to replace the manual vent arm, the oil-filled cylinder automatically opens and closes the vent as the temperature rises and falls. Starts to open when interior temperatures reach 68°F and opens fully at 80°F. Shade kit includes one 7' 6" x 8' 6" piece of 30% shade cloth, and clips to the interior frame of your greenhouse. 10 clips double as plant hangers. Shade cloth lets an optimal 70% of light transmission through to your plants. It can easily be re-positioned for changing seasons or crops. Made from green knitted polypropylene. Weight: 2 lbs. 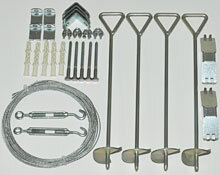 This anchoring system offers the most effective, lightweight and economical solution to anchor your greenhouse. Proper anchoring is the ultimate way to prevent your greenhouse from becoming damaged from unstable weather, even if you don't live in an area prone to high winds. Solexx Early Bloomer Greenhouse Kit 8' x 8' x 6'3"